2019 was freak weather according to all the locals. It was 9 deg at the start and there was still a lot of snow on the ground the last 3 miles. The roads were safe and well maintained. If you do a Vacation Race be sure to stay before and after the race a few days. The race always included a few hike recommendations that if you complete you earn some extra goodies. Besides the cold the bulk of the race was all uphill and at about 3,500 feet of elevation. Some training would be recommended for this course. Very pretty. Put this one on your bucket list! This is the first race in a three race challenge series. The races get a bit harder as the series goes along. You can bib pick up race morning for $20 and in 2019 they added a double down type challenge if you do the 5k before the 1/2 you get an extra medal. Great downhill course! It is ALWAYS freezing at the start. So be sure to pack layers and have gloves. You MUST pick up your packet or have someone else do it the day before the race. Pick up is at the Road Runner HQ, so leave some time for shopping as well. This race is a part of the Route 56 Challenge. So if you run this and the San Diego Craft Classic 1/2 you will earn a challenge medal. Run this race 5 years in a row and earn a nice legacy jacket! This race has a loyalty program. After 3 years you become a member of the Penguin Club and received extra goodies each additional year. They also offer a Golden Snowflake Challenge if you run the 5K on Saturday before the 1/2. If you do this be sure to SAVE your parking pass. You can use it both days. Race morning packet pick up is available for free. I really enjoy this race and hope to keep my legacy streak going all the way to year 10. The course is a bit challenging and there are a few rolling hills in the middle and end. Really pretty course. This is a beautiful course but non stop rolling hills. Be sure to get there early. You have to walk a bit to the start line. Race day pick up is available if you signed up for the race early enough. Great food after the race and a beer are all included with the race entry. If you do all four of their locations in one year you earn the LaceUp Challenge medal. Great series. Will be back in 2019! This is one of three races in the Beach Cities Challenge. Mostly flat course. Be sure to check the weather as there is very little coverage on most of the course. There is always a great spectator turn out and tons of support from local run clubs along the half and full marathon courses. Great course for beginning runners. Great inaugural event. You must pick up your packet the day before. They have a small expo with some decent vendors and last min race essentials. When participating in a Vacation Race, try to stay at least one day beyond the race in order to do the club hikes or the trifecta events. You can earn extra goodies and they always send you to beautiful locations around the parks. Do your research! There are usually a few different airports to fly into. Some are better than others and some will have better car rental selection than others. This race was 5.5ish miles up hill at the beginning. Its a bit of a struggle if you don’t hill train. But 80% of the course was on paved road. The last 3ish miles was on hard packed dirt. Be aware of the elevation. You start at about 4500 and in crease about 1000′ in the first few miles. Start slower than you normally would. This is a great race. Vacation Race consistently puts on great events. Great food after and the medals are always large! Be sure to add this to your bucket list! This was the last race of the SF Original Series. You have to pick up your own bib the day before the race so plan ahead. With your bib and t-shirt for 2018 they gave out a bobble head of one of the SF Giant’s players which was different and fun. Parking is prepay only so plan ahead for this and make sure you know where you’re going. The lots will not accept cash race morning. They do this in order to make parking more smooth. The finish line was inside the stadium and was really well done and fun. The course was mostly an out and back. There was a section towards the end that was on hard packed dirt. There are some really amazing views of the Golden Gate Bridge as well for the first half of the race. Great race and super fun challenge. This is the first of a 4 race series put on by LaceUp. This was the first year for them to have a half marathon at the OC location. If you register early enough they offer race day pick up at no charge. If you register after their cut off date it’s a $5 fee. Parking is limited, so best to get there very early if you don’t want to walk a few block to the start. Generous time limits for all races. Very family friendly event. Food truck food and beer are included with all registrations for the half. I will be back in 2019 for sure! This race has several different challenges. Be sure to check them out! The first half starts the same place as the marathon and where the main finish line is. When you complete the first half the runners all get bused back to the point so it makes it super easy if others in your group are running the full or the 2nd half. The first half is mostly rolling hills. The course has been changed due to permit issues and the city not allowing any race to shut down the Golden Gate Bridge anymore. If you want to run across the bridge run the full. Neither half runs across the bridge. But the first half runs right up to it and if there isn’t much fog you can get some great photos. SF in general is an expensive city, so try to room share and plan ahead. Lots of great food and things to do. If you can stay a few days after the race to enjoy all the tourist things. I will be back in 2019 to attempt the full marathon. I completed the entire 8 day challenge so this was race 7 in the series. I decided to give my legs a break and run the 5K. Doing a smaller distance was fun. The 5K was a lap plus a little extra. There was a purple cone marked “5K” and that was the turn around point on the second time out. Super fun and well organized. I did the entire 8 day New England series with some friends and this was the ONLY race we got lost trying to find. If you’re able to drive out to the race start the night before I would strongly recommend it. These races are all gun start there are no timing chips. We made it in time but it was a bit stressful. Pack bug spray. These races are in parks and wooded areas. All super pretty. Also be sure to keep an eye on weather as conditions in this area of the US can be all over the place. Super fun race. I will be doing a different series in 2019. This was the third day of an 8 day series. I really enjoyed the entire race series. All races are laps, ranging from 5-9 laps for the half marathons. There is one massive aid station and the main turn around that has more food than you could ever eat. Great staff and great support the entire time. Most of these races are in parks or near forested areas so I would recommend packing bug spray. This was my first time doing a Mainly Marathon series. I completed all 8 days of the New England series. Due to the out and back nature of this race series there is one giant aid station. You’re allowed to leave a few personal items and a bottle. The volunteers will keep your bottled filled with water or whatever electrolite drink they have that day. There are usually 2 hot items that are cooked on site each day and they were always super yumie! 🙂 I would totally recommend this race series. I was very happy and surprised with how well these races were ran. I ran all of the 8 day New England series. Be sure to plan things out and have everything ready before hand! The only thing I would recommend is to pack big spray! Most of the races are in parks or near forested areas. If you’re able to make sure you do the Remix Challenge of the 5K on Saturday morning and the half or full on Sunday. Hotels and parking can be a bit expansive in San Diego so plan to room/cost share if you can. I’m not 100% sure but this 2018 course felt less scenic to me than past years. I’m not sure if the course had been changed or not but it wasn’t as pretty as I remember it in the past. Large race and takes a few miles for the crowds to die down. This year was the first year since I’ve been running it (about 5 years in a row) that the full and half marathon started together. So I’m sure this added to the congestion. This is a point to point. It’s best to park at the start. They busses go pretty quickly and the line at the finish usually isn’t too bad. Weather can be hit or miss for this time of year so plan ahead accordingly. the back half of the half is pretty much rolling hills. Overall a fun channeling course. This is a point to point race. I suggest parking at the finish and taking the shuttle to the start. Weather for this race is all over the place 2017 it was raining most of the morning. 2018 was a bit warm. Complete this race, Surf City in Feb and Long Beach in October and earn the Surf Cities Challenge Medal. This is the most difficult course that Rock It offers but it is totally worth it. This is a smaller race but offers a lot of great swag and tons of raffle prizes after the race. Two different distances were offered, 6K and 10miles. The marking for this race is a very very small lot. There is plenty of parking but if you don’t get there early you make have to walk almost a mile to the start line. This was a really fund race. They allowed race morning bib pick up. The street closures start at 5:30am so plan ahead! I stayed for the last runner. It was nice to see how much extra food they had. The last runner had the same food selection as the first runners in. Plenty of course support. Mostly an out and back course. Lot of First Respondents and Officers in full uniform. Great race! Must pick up bib at expo (they allow friends with a waiver) or pay $20 for race day pick up. Park early. Streets close early. This race offers nice legacy status goodies starting at year 3. Really pretty course mostly along the bay areas. Really BIG hill about mile 9. Fun but challenging race. Earn a challenge medal if you do this and the Mammoth race. Will be back for 2019. Rock It Racing is a smaller company that puts on trial runs around So Cal. The courses are perfect for runners just starting out on trails. The longer distances are great for established trail runners looking for a fun challenge. The medals and race swag are always really fun! I do a few of these races every year! I’ve ran this race several times now. It’s as flat of a course as you’ll ever run. Slight hill about mile 4-6. This year they changed the course up and instead of allowing runners on both sides of the road when we turn right to go up this “hill” we were all crowded onto one side. The race felt very very crowded until about mile 6. This is a mostly out and back course. Run this OC, in May and Long Beach in October to earn the Beach Cities Challenge Medal. This race also has a challenge with any distance of the San Francisco 1/2 or full marathon in July. This was the second year of the race. They learned a lot and improved greatly. you must get your bib at the expo so plan ahead. Also be sure to get there by 5:30! Race starts at 7AM by 5:15 the freeway was already backed up. Great race. Rolling hills. Nice double sided medal. This is the first race in the Triple Crown series. All 3 races are around the San Diego area. You must pick up your bib or have pay a race day fee of $20. So plan ahead. They did allow others to pick up bibs for you if they had a copy of your ID. Plenty of parking. This race also offers a full marathon and 5K as well as the 1/2 option. Very hilly. Started a bit latter in the morning so it was a bit warm. Beautiful beach scenery along the entire course. Will be back in 2018. This is apart of the CA Running Series (races all over CA). Nice flat course. Mostly an out and back. Cute medal. Small but well stocked aid stations. Super fun race. They do NOT offer race morning pick up but you are able to pick up friends bibs. Usually a pretty cold race but this year, 2017, was a bit on the warm side. Park at the finish and take the shuttle to the start. The finish is at Torey Pines and the lot is small so get there early. Legacy jacket once you’ve run 5 years in a row. A challenge medal is offered if you also run the SD Craft Classic in the same year (also a super fun race). I’ll be back in 2018! This race offers two races for a weekend challenge. 5k on Saturday and 1/2 on Sunday. BE SURE TO KEEP YOUR PARKING TICKET if you keep your parking ticket you can use it for both days and only have to pay for parking once! I find this course challenging but super fun. 2017 was my 5th year running it. If you run 3 years in a row you become a member of the Penguin Club and every year after that you get a new pin with a different penguin on it. Will be back for 2018! This is a really nice flat course. It’s out and back. My main advise would be to rent a car. The area this race is in, Cocoa Beach, FL, is very spread out and having a car is super helpful. That being said if you stay at a host hotel race morning shuttle service is provided and I’ve never had a problem with it. The locals are super fun! Along the half there are always about 3-4 alcohol stations. Super fun. Nice big medals. They also usually offer multi year challenges. 2021 will be the 50th anniversary for this race. This was a new course for 2017. It was point to point so be sure to plan transportation accordingly. I would also recommend gloves or toss away clothes for the start. It’s early and can be chilly further up. Lots of goodies at the finish are included with the race entry. Lines for food tended to be a bit long but totally worth the wait. This is also part of a series. If you do all 4 of their locations in one year you’ll ear a challenge medal! Totally going to do this one again in 2018. This is the third race in the Beach Cities Challenge. Great race. The full starts about 1.5 hours ahead of the 1/2. So plan ahead for parking options. There is plenty of parking options and prepaid parking at the expo. 2017 had perfect weather. All the volunteers are super nice. Super flat course. Watch the weather. In 2017 it was crazy hot! Cute little town. They raffle off a truck at the end of the race but you MUST be present to claim the prize. This is the first race in the Conquer LA Challenge. Nice smaller race. Be sure to get there early and park at the finish. About a 1+ walk to the start line. The course was very flat and is basically an out and back. There was shade on the way out but coming back temperatures were over 90 deg F. There was plenty of water and Gatorade. They did not run out! There were constantly cops and course support asking if runners needed a lift or were ok to continue. They actually kept the finish line open another 30 min to let people finish. Great race. You get a bottle of wine with the 1/2 or full. There was an option to do a 5K or 10K the day before to earn a challenge medal. This race is a bit on the pricey side so plan ahead. This race starts a little latter than normal since it is the second 1/2 of the full. Be sure to bring a throw away shirt or space blanket to the start. It’s cold standing around but you warm up fast when you start running. Park at the finish and be sure to be on the first bus to the start. It was about a 30 min drive. Great course and great course support. I’m doing the full in 2018. This race offers a few different challenges so be sure to check out the web site. HILLS! and a challenge medal series! The course has changed a bit from the year before. A few hills seem to have been taken out. Still a really hard, challenging but fun race. Get there early as you have to park at the finish and shuttle to the start. They offer gear check so you don’t have to get rid of your jacket. The race ends at a brewery so one beer per bib and more inside if you’d like to pay for it. Do this race and the SD Holiday 1/2 in December to earn a challenge medal. This is the first year Vacation Races put on a race at this location. First 5 miles are up then the rest is downhill with amazing views of Glacier National Park. Be prepared to drive! Depending on where you stay you’re either right at the shuttle stop for the race for a 2 hour drive away. If you’re a 2 hour drive from the shuttle start you’ll be closer to better restaurants and activities. I stayed in Browning. It wasn’t that bad but the nearest real grocery store was about 100 miles away. Great race!! Totally recommend it! The start line was in the low 50’s but they had space blankets and were handing them out to runners as they were getting off the shuttle bus. The first half of the race is rolling down hill and very pretty. But about an hour in it warmed up to 70+ deg and there was little to no shade/tree coverage. It was a great race. Will be back next year. I’ve done this race for 4 years now because it is a club race. I’m not really a fan due to this course and hills. It’s a point to point but the bus system at the finish line always runs pretty smoothly. The finish line for the 1/2 is a sharp up hill followed immediately by a sharp left turn. Not the best way to finish a race. This race is point to point so you’ll need to do a little planning. 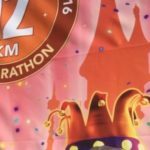 This year, 2017, it rained right after the full marathon took off. There were not too many places to take shelter. The pace team members were really great and were able to get me to my goal time. I will be back for this race again in 2018. It is also part of the Beach Cities Challenge. Super hard but totally worth it for the views. This is a smaller race so the course doesn’t get too crowded. Plan ahead and get there early! Parking is super limited and you may get stuck walking for about 15 minutes to the start. Totally going to do this one again next year. This is not a race you can just get up and do. I highly recommend doing some endurance training. The distances aren’t that bad if you’re doing a regular team of 12 runners. It’s the lack of sleep and being in a van that will kill it. Read the pre-race materiel! There is a lot of good tips and tricks that first time runners should follow. Fun race! Will totally do again next year! NOT FLAT! It was a little challenging a week after the LA Marathon but totally doable. Great finish line! They handed out cuties along the course. Had hot oatmeal and hot chocolate for every runner at the finish line. Very well done for a first time race. This was my third attempt at LA. I am officially done with this course. There were major issues at the shuttles to the start line. Took about an hour to get near the front. They were trying to do a security check through everyone’s bags/fuel vests. When they finally realized it was taking too long they started handing out red bands (that meant they had checked your bag) to everyone and told them to go the front of the line. Runners were then running to the buses in an almost panicked fashion. Very very stressful right before the race. I hope they fix it before next year. Right before mile 9 there is a huge looooong hill. The race directors even put a timing mat at the bottom and top so you can see how you do. Super fun race. They give extra swag for every additional year you participate. A nice jacket a year 5. You can pay extra to have race morning pick up. Otherwise you’ll have to drive to San Diego the day before to pick up your bib. If you’re not running the 1/2 get to the start early! There is a relay and 5K. These runners have to be bused to their starting lines. Great race. Will be doing it again in 2018. This race started and ended at the Grove in LA. They offer race morning pick up of bib and goodies. This series is to remember first responders. There were cadets from each branch and they ran the 10K in formation. Really neat to watch them all go by. The 10K and 1/2 started together so it was a bit crowded the first 3ish miles. I would consider this course hilly. It was challenging but still doable and fun. When you pick up your bib you also get to choose a coin. I believe there were 6 coins in total and each one honored a different first responder team. LAPD, LAFD and so on. You add the coin to the center of your medal. So you could potential have 6 different medals. This is the fourth year I’ve done this race. The first year with a new company putting it on. Be sure to plan ahead. Parking can take a while since most runners have to park a ways away and get bused to the start. This year more than ever it felt a bit crowded. The crowd never really thinned out. I thought they could have allowed more time in between corrals. Great beach views and super fun vibe. Do this with OC in May and Long Beach in October and earn extra bling. Super cute new race. They offered a 5K and 10 miler. The finish line you received a really fun medal, a packet to make hot coco and a box of 4 Godiva chocolates! Parking was super easy and close. Great local little race. This was race two in the Conquer LA series. Pasadena is VERY hilly so please be prepared for those! Also, this was an inaugural year so there were some common first race issues. MANY people showed up late and they allowed people to park, which was right across the race course. So they waited for all the cars, which made the race about 25 minutes late. It was also cold and raining. But the race directors do not have control over this. They did the best they could to make it a fun finish. Mylar blankets for everyone and bottled water and snacks. I am very willing to do this race again in 2018.